The above video from KOMO in Seattle has been making the social media rounds today and is well worth a look. As you will see, a dog — minus its owner at times — has learned how to board a bus and ride to its favorite dog park. But here’s the thing. The rules on King County Metro in the Seattle area are different than Metro. On our system, dogs and pets must be in carriers, as per the Metro Code of Conduct. Service animals and police dogs are allowed on board as long as they’re leashed. Why the difference between the two agencies? The main difference is size. King County Metro is certainly a big agency and averages about 317,000 boardings on weekdays on its bus system, according to the latest American Public Transportation Assn. ridership estimates. On the other hand, Metro has about 1.08 million weekday bus boardings. Let’s face it: space on our buses at peak hours is often at a premium, which isn’t an ideal condition for dogs. Or riders. I think the other issue here is — and there’s no way to skirt around it — is that many of us own dogs that can’t be counted on to always play super nice with others. Or perhaps they play in a way that can be best described as “completely crazed.” Which is to say that as much as I love my pit bull mix Blue (a rescue), I’m not too keen on trying to take her on a bus or train and seeing how she would cope with another doggy passenger. And I wouldn’t want to frighten or make another passenger uncomfortable. One other thought: Metro’s bus operators are already working in a very busy environment between dealing with traffic and passengers. Adding dogs to the mix and making operators play Judge Judy as to which gets to board and which are left at the curb doesn’t seem like an additional duty needed at this time. All that said, kudos to Seattle for pulling it off — they’re more exception than the rule when it comes to transit in the U.S. and it’s nice to see it can be done. Potential Pacific Northwest emigrants take note! Typo alert! I’m pretty sure that King County Metro doesn’t have 317 million boardings on the average weekday. Quick correction: According to the APTA’s statistics, King County Metro averaged 317,000 boardings, not 317,000,000. Also: “our different than ours”? It was fixed by our crack Source staff. Thanks for heads up! Saw the piece on the ABC evening news last night (the last item, just before Jeopardy) What it didn’t answer is how the furry passenger pays his fare. Correct. I would expect a solo riding pooch to tap! Except that their smart interagency farecard system is called ORCA. The pooch is still violating their rules: Sitting on seats and not on a leash. Since the drivers know the dog, I think that this one is okay to let slide. The differences in daily boardings isn’t really the issue, LACMTA has more busses than KC Metro so it can handle more riders. The issue is how transit is perceived in each city. In Los Angeles it was long seen as a means of last resort and increasingly the management was allowed to treat riders as such and operate a system that looked down on their clientele. Seattle, partly due to geography but also due to public policy (including parking caps), has long offered a high quality bus system that catered to many different groups in the social strata. So riding a bus there has not been given the stigma it was in Los Angeles. 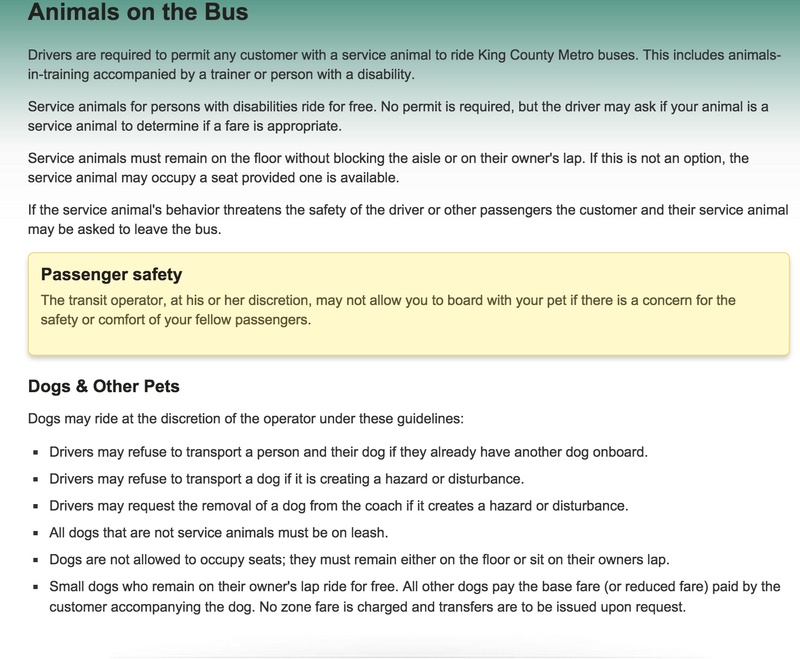 So yes, you can bring a dog on a bus in Seattle (which also has had rail transit, operated by KC Metro for Sound Transit, since 2009) and it should be allowed using the same rules in Los Angeles, because Los Angeles County Metro could learn a thing or three from Martin Luther King County Metro about attitude. Dogs are only as nuts as their owner. On the other hand , I would prefer to dealing with said dogs than their owners. Passengers who ride the buses and trains everyday see some of the crazed individuals that board. But operating a bus for eight to ten hours everyday can be both stressful and again entertaining. One night a usual disturbed woman who would constantly talk to her self asked me about a message coming over the bus radio. I was in a good mood and just replied, “oh, this is a space ship and were going to the moon.” she replied, ” oh, I don’t hink I want to go to the moon tonight,” and got off at the next stop. There was a bus just a few minutes behind me so she got to where she was going. And yes, she was on the bus the next night. Space being limited on board our buses is highly related to our flat rate fare system. People want more bang for the buck. If it costs the same amount to go a mile or 20 miles, they’re going to use it for 20 miles more and hog up all the space. It’s basically Econ 101. Demand is high for longer trips will diminish supply (space) on the bus, therefore it naturally, makes sense to make lengthier trips cost more. Supply (space) will be increased if more people use it for shorter, quick trips which continually frees up the supply (space), so it makes sense to make shorter trips cheaper to encourage that. That’s exactly how every transportation pricing works, whether it be taxis, Uber and Lyft services, to FedEx shipments to Amtrak and airplanes. Surely you understand why a plane ticket from LAX to Phoenix, AZ is a lot more cheaper than LAX to Sydney, Australia, right? Seeing a non service dog on Metro Buses is not that uncommon. Most drivers don’t want the hassle and tend to not say anything. I also see them on the Red Line as well as in stations almost daily. There’s almost never anyone patrolling stations and trains anyway, except when they’re at the turnstiles checking Tap cards. It’s been weeks since I’ve actually seen a sheriffs deputy on a train and I spend a good couple of hours a week on the Red Line getting around town.